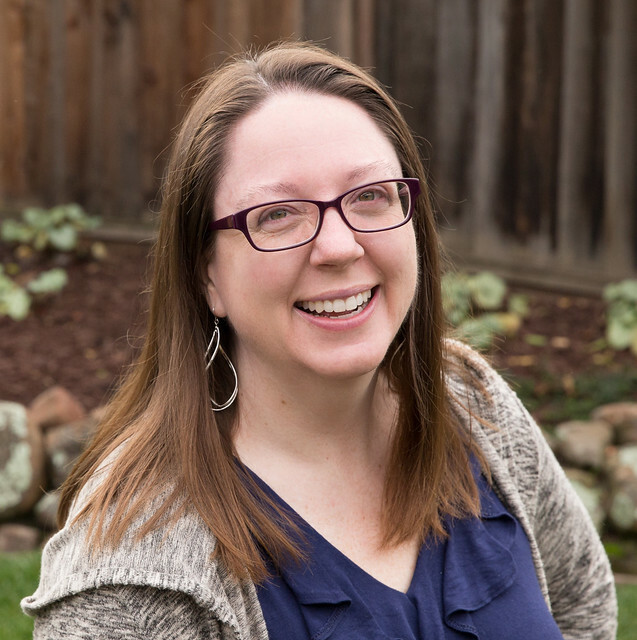 Cheryl from Meadow Mist Designs is hosting her second online mystery quilt. Just getting the cutting instructions into my hands made me even more excited about this project. I love a mystery quilt. It's not too late for you to join in. Head over to Meadow Mist Designs for the fabric requirements and cutting instructions so you can catch up and start sewing with us the first week of August. I got them all cut out the first week of the month. Now, I'm excitedly waiting for August. I missed Cheryl's first mystery quilt (Foothills Mystery Quilt), but I have previously completed two other mystery quilts: Candy Shoppe and Bold Blooms. 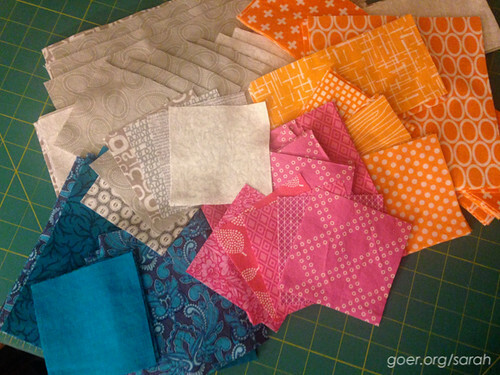 In both of those I never saw any other finished quilts from the same pattern... it will be very fun to see how this project develops from all the different palettes as people share their progress online. Remember, it's not too late to join in. You have lots of time to choose and cut fabric before the next set of instructions come out on August 6th. Have you ever done a mystery quilt? What's your favorite part? Is there anything you didn't like about the process? Posted in Quilting. 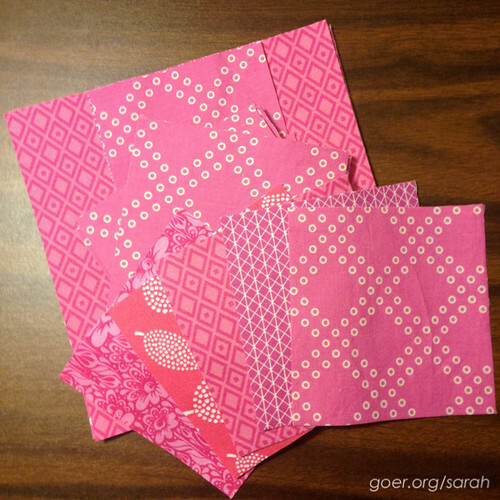 Tags: Midnight Mystery Quilt, mystery quilt on July 16, 2015 by sarah. I like the colors you have chose, Sarah. I admit I'm intrigued. I've never done a mystery quilt but I love the idea. Thank you, Carrie. I look forward to working on this project. It's a different palette than my norm. It's not too late to dive in. The first sewing instructions won't be up for a couple weeks. 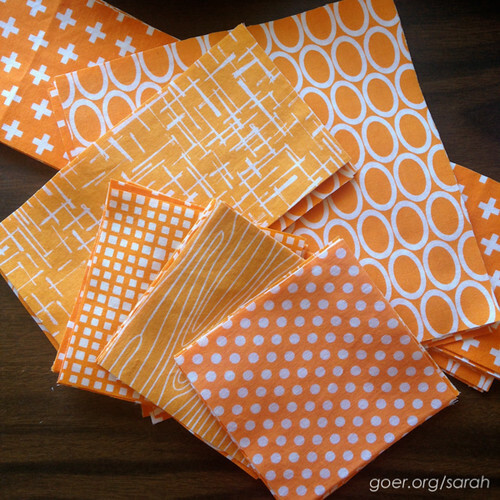 There's lots of time to pull fabric (or shop) and get the cutting done. Love your colours. I joined in as well, and orange is one of my colours. Can't wait to start sewing. Thank you, Anja. I don't see it on your blog and can't remember if I've seen your fabric pull on FB... what other colors are you using? This will be the third mystery quilt I have made, too. My first mystery quilt was with Bill Kerr and Weeks Ringle, and the instructions came out once a week for 6 weeks. It was a fast pace! I really appreciate that Cheryl gives out her instructions once a month! I have plenty of other sewing to keep me busy between steps. And since this will be the first time I'm doing a mystery quilt within a community, faster paced would be a real challenge to keep up with and not have the surprise of the design spoiled by seeing other people's progress. That said, I can't wait for August! I think that directions coming out monthly (instead of something like weekly) will make it easy to stay caught up. I'm looking forward to starting the sewing process next month. Thanks for visiting! Love your fabric choices. I love a mystery quilt too. I have made several. Last year I did Pat Sloan's Globetrotting and Aurifil BOM. This year I have several BOM's going on and I'm also going to participate in Cheryl's. Earlier this year I followed a random four month mystery quilt I found searching on Pinterest. I've always been happy with the finished products, although sometimes the in-between can feel like a roller coaster of hmmm? Hi Sarah . I'm taking part too and have fallen behind already . I have my fabric but have neither blogged , cut it or added it the fb page ! I'm using a combination of stash and bought . It does look fun though . You are not behind. You have a lot of July left to get the cutting done! And there are no social media requirements. :-) I look forward to seeing what you chose. Thanks for visiting. I'm also participating. Have my fabric cut but not blogged about it yet either. 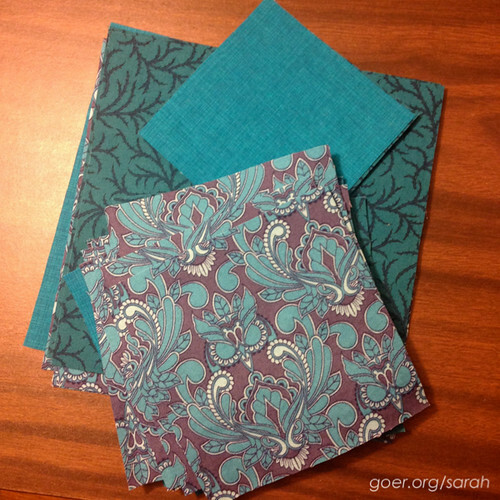 I love the fabrics you chose Sarah. I've participated in a couple of mysteries. I didn't like the first one....making colour choices without a pattern can be quite difficult...but the others were o.k. I think this one will be really fun! Cheryl's first mystery quilt was a great design. Thanks for visiting!